Awesome replacement tire for old school 10 speeds. Great tire, improves the look of your bike and provides a pleasant smooth ride. I will buy another pair next time I need bike tires. Does a nice job on the road mounted on my 1985 fuji del rey. Be careful - this is a beaded tire and will not work on all 27 rims. I was buying a new tire to refurbish my old 80's road bicycle. I was unaware of beaded versus non-beaded tire construction. Is this something new? Anyway my new beaded tire did not work on my straight walled rims. I donated it to the Earn-a-Bike charity where I volunteer. The tire was well make and had substantial tread. I'm sure someone's will get a fine new tire in the near future. I'm a casual rider, about 10-15 milesday on level ground in san diego. no off road at all. the vittoria's seem to repel glass very well and I'm getting a year's worth of mileage from them. I replace them well before any corethreads appear. good value. excellent lightweigh tire to get smooth ride and performance. Well made, easy to mount tire. Rigid and well fitted onto the rim. Overall good tires. They were widerthicker than I expected. I put these on my vintage road bike for daily commutes to work. At 100 miles in they are still handling very well and gave me no trouble fitting the 1x14 inch tire to the rims. I've used this tire on many vintage bikes for a updated ride and look over gum wall tires. The 1 18 wide size has worked best for me to replace 1 14 gum walls. Great tire for the price, looks smooth with a color tire to offset...they last. I was rolling 27 mi. round trip to work. Killin it on the fixie! I found these tires extremely difficult to mount. As a result I would not feel comfortable using them on a ride any distance from home since remounting after a flat repair would be difficult. Very good upgrade from the Kenda K35's I was using. No punctures so far on low maintenance back-roads. Have purchased this model tire for several years for my 27 inch Raleigh 10 speed which I still have from the mid 70s. It fits well on my original front wheel and the replacement back wheel which has a slightly different rim. Can be pumped up to a high enough pressure for a good road bike ride. Overall price and performance are good for these tires. It's getting harder to find 27x1-1/4 tires and tubes. Glad these are available and reasonably priced. Thanks for your review! I'm glad we were able to help you out with these 27" tires. 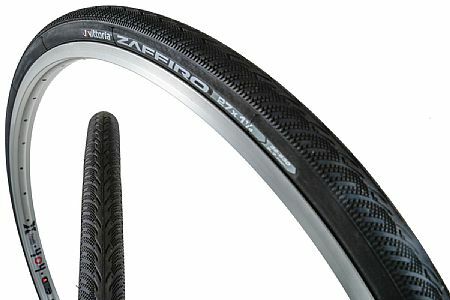 As far as tubes, rubber is pretty stretchy, and a 700x28/32 tube will work fine with your 27x1-1/4 tires! Back to basics, fresh rubber, low price. Really like the product. Italian company, made in Thailand. The blackwalls gives my vintage road bike a hip modern look for the price less than a Walmart standard Bell and they ride super smooth with little fuss time during mounting. I can't quantify the dot traction stuff they talk about but if you are stripping cracked 30 year old alligator skin gumwalls they are ideal. This tire improved everything about the ride. The quality of these tires was obvious as soon as I opened the box. They went on the rim smooth as silk, and improved the looks of my bike when pumped to correct pressure. On the street, I noticed that the ride and control had improved tremendiously. The big surprise came when i hit my first climb. I reached the top without going to my normal low gear! The rolling resistance made it possible to top the hill at a speed I'd never achieved before. I would definitely buy these again!